y= wlanVHTSIGA(cfg) generates a VHT-SIG-A time-domain waveform for the specified configuration object. See VHT-SIG-A Processing for waveform generation details. [y,bits] = wlanVHTSIGA(cfg) also outputs VHT-SIG-A information bits. Generate the VHT-SIG-A waveform for an 80 MHz transmission packet. The 80 MHz waveform has two OFDM symbols and is a total of 640 samples long. Each symbol contains 320 samples. Generate the VHT-SIG-A waveform for a 40 MHz transmission packet. Create a VHT configuration object, and assign a 40 MHz channel bandwidth. Generate the VHT-SIG-A waveform and information bits. Extract the bandwidth from the returned bits and analyze. The bandwidth information is contained in the first two bits. As defined in IEEE Std 802.11ac-2013, Table 22-12, a value of '1' corresponds to 40 MHz bandwidth. Format configuration, specified as a wlanVHTConfig object. The wlanVHTSIGA function uses the object properties indicated. See IEEE® 802.11ac™-2013, Section 22.3.10.9.4 for further description. VHT-SIG-A time-domain waveform, returned as an NS-by-NT matrix. NS is the number of time-domain samples, and NT is the number of transmit antennas. NS is proportional to the channel bandwidth. The time-domain waveform consists of two symbols. See VHT-SIG-A Processing for waveform generation details. Signaling bits used for the VHT-SIG-A, returned as a 48-bit column vector. The very high throughput signal A (VHT-SIG-A) field contains information required to interpret VHT format packets. Similar to the non-HT signal (L-SIG) field for the non-HT OFDM format, this field stores the actual rate value, channel coding, guard interval, MIMO scheme, and other configuration details for the VHT format packet. Unlike the HT-SIG field, this field does not store the packet length information. Packet length information is derived from L-SIG and is captured in the VHT-SIG-B field for the VHT format. The VHT-SIG-A field consists of two symbols: VHT-SIG-A1 and VHT-SIG-A2. These symbols are located between the L-SIG and the VHT-STF portion of the VHT format PPDU. The VHT-SIG-A field is defined in IEEE Std 802.11ac-2013, Section 22.3.8.3.3. The VHT-SIG-A field includes these components. 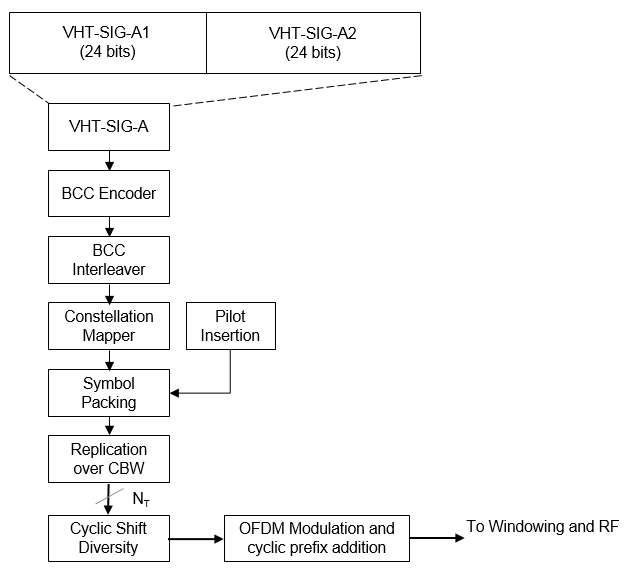 The bit field structures for VHT-SIG-A1 and VHT-SIG-A2 vary for single user or multiuser transmissions. BW — A two-bit field that indicates 0 for 20 MHz, 1 for 40 MHz, 2 for 80 MHz, or 3 for 160 MHz. STBC — A bit that indicates the presence of space-time block coding. Group ID — A six-bit field that indicates the group and user position assigned to a STA. NSTS — A three-bit field for a single user or 4 three-bit fields for a multiuser scenario, that indicates the number of space-time streams per user. Partial AID — An identifier that combines the association ID and the BSSID. TXOP_PS_NOT_ALLOWED — An indicator bit that shows if client devices are allowed to enter dose state. This bit is set to false when the VHT-SIG-A structure is populated, indicating that the client device is allowed to enter dose state. Short GI — A bit that indicates use of the 400 ns guard interval. Short GI NSYM Disambiguation — A bit that indicates if an extra symbol is required when the short GI is used. SU/MU Coding — A bit field that indicates if convolutional or LDPC coding is used for a single user or for user MU in a multiuser scenario. LDPC Extra OFDM Symbol — A bit that indicates if an extra OFDM symbol is required to transmit the data field. MCS — A four-bit field. For a single user scenario, it indicates the modulation and coding scheme used. For a multiuser scenario, it indicates use of convolutional or LDPC coding and the MCS setting is conveyed in the VHT-SIG-B field. Beamformed — An indicator bit set to 1 when a beamforming matrix is applied to the transmission. CRC — An eight-bit field used to detect errors in the VHT-SIG-A transmission. Tail — A six-bit field used to terminate the convolutional code. The VHT-SIG-A field includes information required to process VHT format packets. For algorithm details, refer to IEEE Std 802.11ac-2013 , Section 22.3.4.5. The wlanVHTSIGA function performs transmitter processing on the VHT-SIG-A field and outputs the time-domain waveform.